Kolaghan's Command ($11.98) Price History from major stores - Dragons of Tarkir - MTGPrice.com Values for Ebay, Amazon and hobby stores! 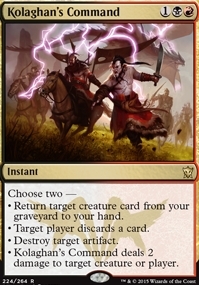 Card Text: Choose two - ? Return target creature card from your graveyard to your hand. ? Target player discards a card. ? Destroy target artifact. ? 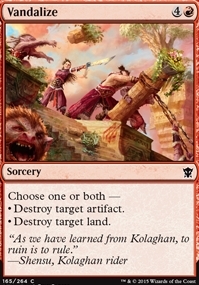 Kolaghan's Command deals 2 damage to target creature or player.